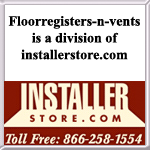 Continental specializes in vents like toe kick registers, triangular returns and registers, and much more. All Continental products are manufactured here in the USA. This steel toe kick register comes in 3 handy sizes for tight spaces. Our brown vents are equipped with an adjustable damper which will open or close off airflow distribution.